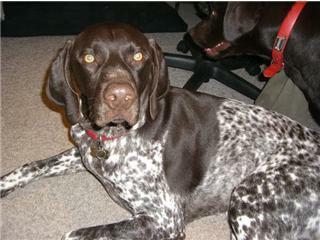 Tucker is a boisterous 3 year old German Shorthaired Pointer who is an absolute joy to own. His enthusiasm for new smells and sounds is never dampened, expect when he gets himself into trouble, which happens far too often for my (and my bank account?s) liking! In a one month span, we made two trips to the vet clinic. On the first occasion, while hiking at a Provincial Park, Tucker's foot was badly cut by broken glass (a reminder to all that glass should be recycled, not tossed in the forest!). His foot was bleeding profusely, so I used my scarf to bandage his foot until I could get him to my truck. Once at the truck, I cleaned and re-bandaged his foot using the First Aid Kit I kept in my car and we took off to the vet. Tucker required multiple stitches and have to have his foot wrapped for three weeks; his foot has since healed nicely. A few days after receiving a clean bill of health, while we were hiking on the Bruce Trail, a kind lady whom I crossed paths with informed me that Tucker was bleeding. Silly me, I assumed it was his foot! Not this time, it was a 15cm gash across his chest. Fortunately his wound was gruesome, yet not deep so there was little bleeding. Once back at my truck, I was able to clean and lightly bandage his wound until we reached the vet. Once again, he required multiple stitches, yet healed nicely. It's been a month since his last injury and, fingers crossed, Tucker (and I) won't have any more trouble? for a long time. Comments for Tucker in Trouble.....Again! Like they say when it rains it poors - and the same goes for pets and livestock. I hope Tucker is over his booboo's. We had a similar deal happen with our horses last year only ended up being a little more disastrous, we had a horse get very sick, wasn't a 100% sure what was wrong with him, we treated him for Quick Phanoea (can't spell, bad cold gone to lungs) after treating him and spending countless hours seeing to his care he later died - he was sick for about a month. We dearly miss him, he was one of our top rope horses, plus an awesome all around horse.